I have great news for the HTC Rezound users as the Android 4.0 Ice Cream Sandwich OS update has been released. So, in today’s guide I will show you the easiest way in which you can install this long-awaited OS update on your Rezound. This upgrade isn’t coming straight from HTC, meaning that it’s not yet official; but luckily for us, we managed to put our hands on it and now we are offering you the possibility of installing it on your device. Take a look below for the proper step by step guide. 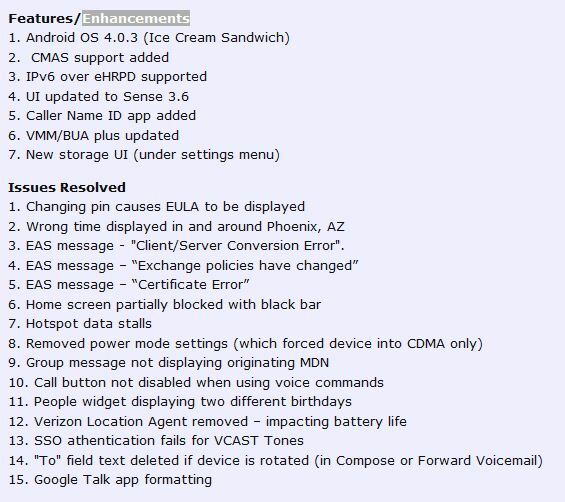 Recently we have brought you a list with the possible devices to receive the ICS update, with the Rezound among them. But, back then we didn’t know that it will be coming so soon. Anyway, it’s not that surprisingly considering that numerous ICS firmware (officials and more often unofficial ones) are being launched day by day. Therefore, don’t worry, just complete this tutorial and enjoy the new Android experience. The HTC Rezound was released last year, in November and its specs are including a powerful 1.5GHz dual-core processor, 4G LTE support, 1024 MB of RAM memory, an 8 MP rear facing camera along with a 2 MP front facing one and the Beats Audio support, which truly makes it unique; a powerful handset indeed. And with this new Android 4.0 ICS Firmware released it will be even more appealing. As you will see, completing the tutorial will be extremely easy and also fast. You have it all explained and detailed below, so everybody can understand what and how to install the update on the HTC Rezound handset. Take note that installing the Android 4.0 on your HTC device will make you void the warranty. This means that in case if something bad is happening, or if somehow you wreck your phone, nobody will help you out. So, think twice before going to the next section of this guide. If the up-mentioned advertisement is uncomfortable for you then maybe you should stop here. Furthermore, the update can be applied only on a rooted Rezound therefore you must first gain root access and only then return here. Backup all you need to from your device. If not you can lose precious personal info. The apps must be saved too. If you don't know how you can use our step by step guide: download SMS backup and restore apps for Android. The battery should show more than 60% power. If lower go and charge your phone first. Deactivate the security tools from the computer and from the handset. You don't want them to interfere with your work. Enable the USB debugging in your HTC device. Just tap and follow: “Settings -> Applications -> Development -> USB debugging”. The USB debugging can be enabled only before the device is connected to the PC. With the up mentioned clarified you can go and start the basic procedure. Make sure you do it as it is described below. First download the tools you will have to use. Get the file from here, and place it to your Windows / MAC / Linux running computer. Rename the file to “PH98IMG.zip”. Connect the phone with the PC by using its USB cord. Place the renamed file onto the root of the SD Card. Reboot it by entering into the bootloader. This can be achieved by holding down (simultaneously) the VOL DOWN and Power buttons. In the end, reboot the phone and that’s it. Now, that is the procedure in which you can update the HTC Rezound with the Android 4.0 ICS Firmware. That was easy, wasn't it? Well, stay close for further guides and share the problems (if there were ones) with us.